Most allotmenters will recognise this scenario. You take on a plot and beat back the weeds and undergrowth and have a moment of discovery when you come across a rhubarb patch. 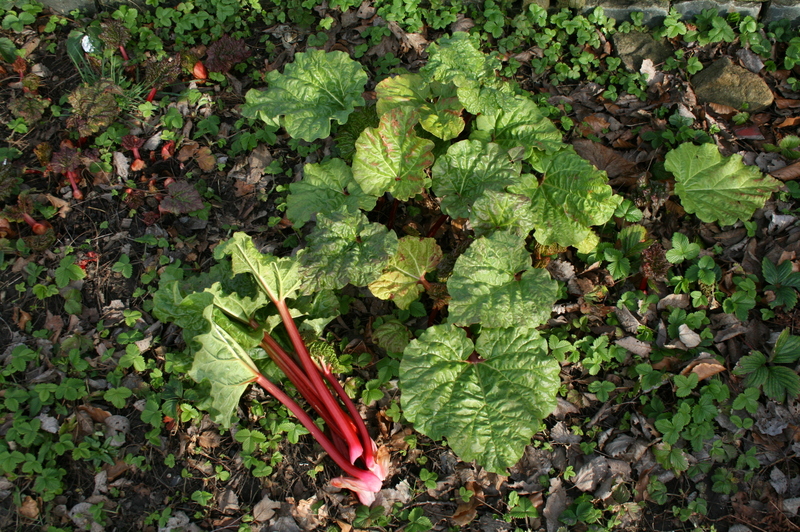 It seems that every plot has an obligatory few, or many, rhubarb plants. Once established they do their thing, cropping annually and early without the allotment holder paying them any attention. They seem like the ideal plant to have, if you like rhubarb that is, and I do. But, each year as the plants grow stronger and crop more prolifically so does the challenge to the allotmenter who strives to eat seasonally and reduce their food miles. Yes, I know I’m a little late with this post – but in case you’ve exhausted all your regular recipes I thought I’d share a few of mine. Of course, some rhubarb can be given away to friends and you may even find that despite your most egalitarian impulses you even begin to categorise and perhaps maybe even judge, your friends by the enthusiasm with which they greet your offer of unlimited rhubarb through the season. But what you need really is a good repertoire of recipes to make best use of your rhubarb and avoid the guilt of neglect, waste and space given to something you don’t really use but don’t want to dig out and compost either. I have some criteria for such recipes which may reflect how I allotment and how it fits into other areas of my life. You may want to come up with your own. 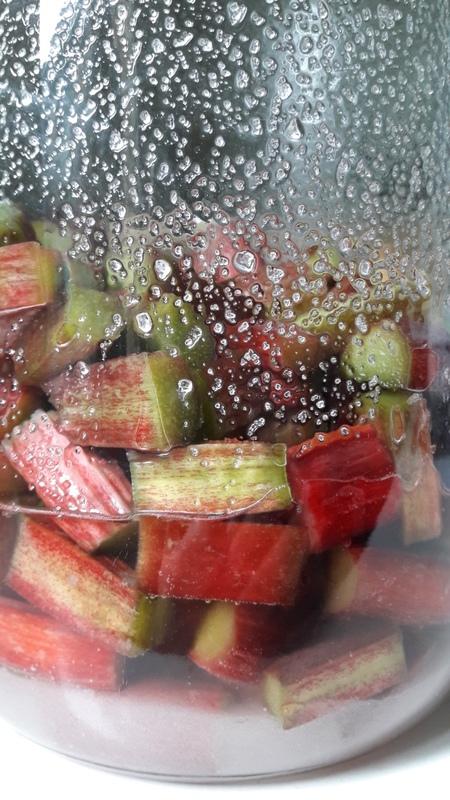 Can not be too fussy – if I want to use the rhubarb at its freshest that means doing so on a Saturday or Sunday evening after a long day at the allotment when I’m already pretty tired. Cooking with those bendy stalks that have been in the fridge a week is not the most inspiring prospect or my reason for growing my own. Have to use a decent amount of rhubarb. Recipes that use a couple of stalks with a mountain of other ingredients that I don’t grow or aren’t in season at the same time doesn’t really work for me. Have to be tasty- it seems obvious but I’ve experimented with a lot of recipes that fail to harness the rhubarbiness of rhubarb somehow. Need to be something I’d eat or drink happily and reasonably regularly without having to completely change my eating habits. 1. 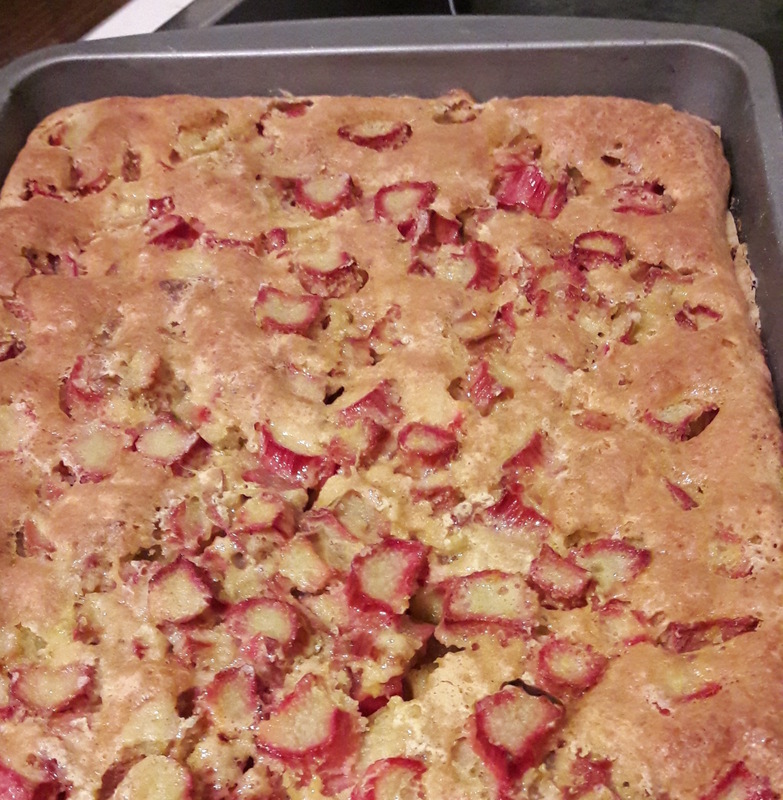 Rhubarb shortbread – this is my number one because it meets my third criteria and then some. 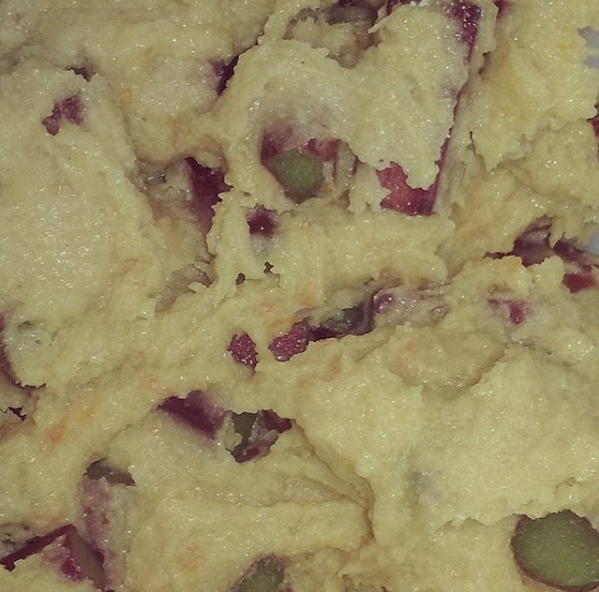 It is a little fussier than most and for that reason isn’t made as often as one member of the household would ideally like, but if you follow me on instagram you will see the first rhubarb shortbread of the year has been worthy of posting annually. It’s a recipe I’ve shared with others and made for events and it always meets with approval. 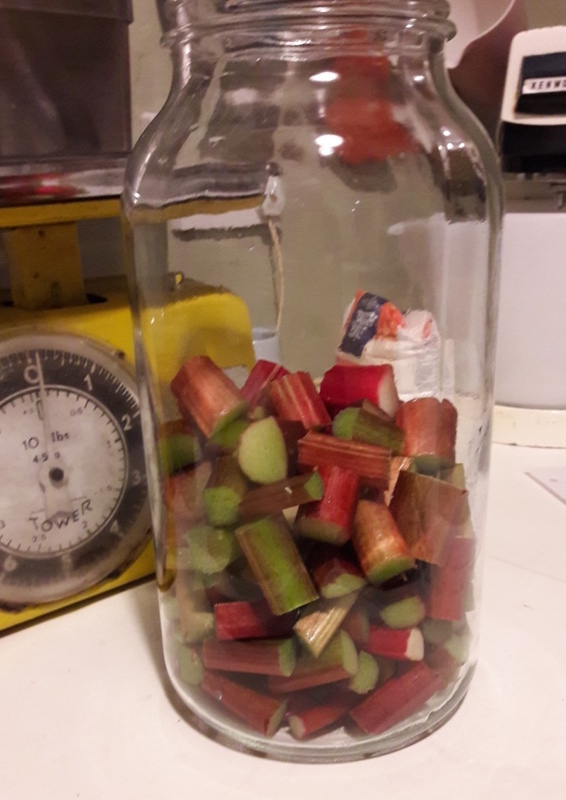 It may be a little shy on the rhubarb content if you follow the recipe slavishly, but I don’t and always add a bit more. This recipe originally came from Sainsbury’s in house magazine – years ago – looking online I now see that someone has attributed it to Nigella writing for a ‘Women’s’ Magazine – if it is Nigella, thank you, this is a fabulous recipe which you can find here. The shortbread is quite heavy on butter so try not to over work it or is will get very soft – feel free to refrigerate briefly before of after putting in the tin if it is, before baking. I often try and keep it to a consistency where I can roll it out to avoid handling it with my warn hands. The amount of shortbread to topping is a bit skimpy making this quite fragile – depending on how you plan to serve it you may want to increase the shortbread quantities by a half. Don’t be tempted to add the rhubarb to the other topping ingredients whilst the base is baking – you can mix everything else but the rhubarb and just add the rhubarb at the last minute. 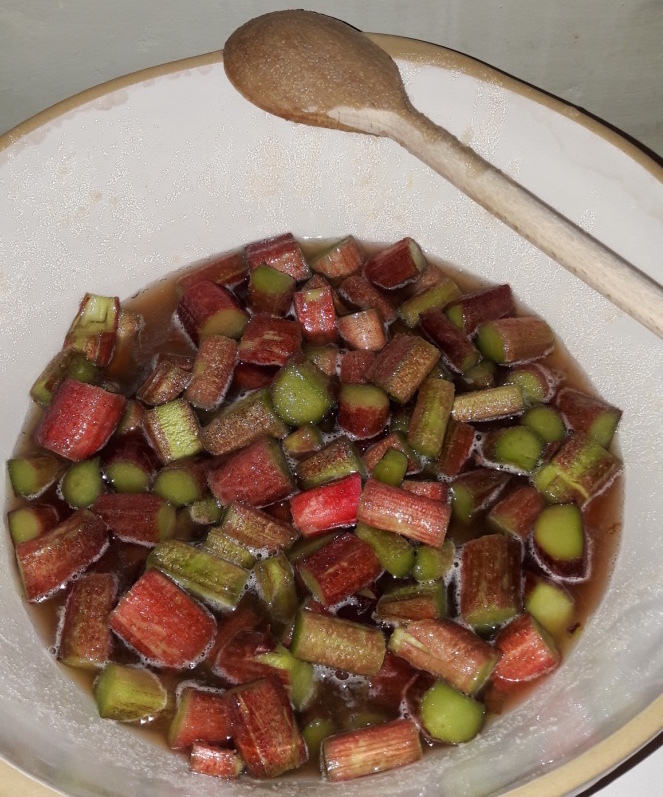 If you add the rhubarb before and let it sit, the sugar will draw the juice out of the rhubarb and you’ll have a very liquidy topping that may lead to a ‘soggy bottom’ – to quote a more experienced baker than I! I don’t line y tin with foil – I prefer a loose bottomed flan tin. 2. River Cottage soft rhubarb jam. I think this is amazing… but… I’m not really convinced it’s a jam. Now this maybe because as much as I love rhubarb I’ve yet to find a ‘proper’ jam recipe that does it justice (and I’ve tried a few…). By which I mean something that sets well enough to keep over a long time frame unrefrigerated and combines both flavour and texture to rival other jams I make e.g. plum, gooseberry, blackcurrant or in good years, fig, raspberry, peach or strawberry. 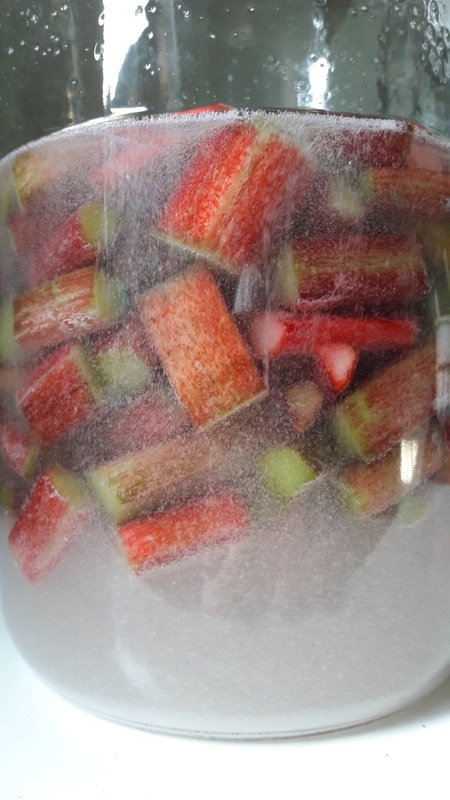 Rhubarb is low on pectin so getting it to setting point even with jam sugar can be a bit hit and miss. 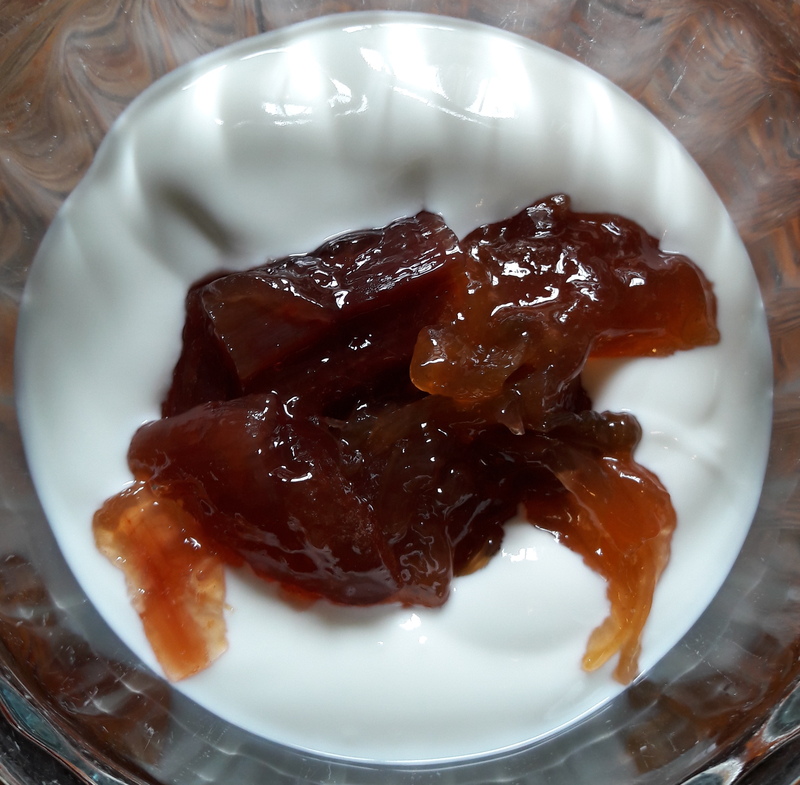 This recipe avoids you having to worry about that – it’s supposed to be soft and is more of a compote in my book which makes it a perfect accompaniment to unsweetened natural yoghurt, or I imagine in anticipation, a good vanilla ice cream and in even greater anticipation, a stem ginger ice cream. 3. Rhubarb Gin – Flavoured gins are all the rage just now and I’m sure Rhubarb Gin will convince even the most rhubarb sceptic of its virtues, no really. It’s such a simple thing to do, again it’s just a case of mixing ingredients and then forgetting about them for a while. I use a big glass sweet jar that I’ve had in the cupboard for years and this recipe from BBC Good Food. 4. Rhubarb cordial – This was new to me last year but the tart refreshing taste of this cordial was an instant hit, especially in the warmer weather. In fact I thought I’d made loads but we ran out pretty early in the summer, before I even got chance to try it out in some cocktails (there are some interesting options here). It meets criteria 2 in using lots of rhubarb and criteria 1 because, like the jam, the process of making is spread over 2 days. I used this recipe. I’m afraid I never got around to taking pictures of this in the bottle, but it looked similar to the Rhubarb Gin above with that lovely pink colour which also transfers nicely into your cocktails if you go down that route. 5. Rhubarb cake – This is my own take based on a basic Australian Women’s Weekly Almond Cherry cake recipe but with the cherries removed and with rhubarb mixed in instead and the addition of some flaked almond and demerara sugar sprinkled on top – It makes a crunchy top which I think complements the softness of the cake and squishiness of the cooked rhubarb very nicely. This is a quick all in one bowl speedy cake to make – I use my vintage Kenwood for it. Combine 185g butter, 165g caster sugar, 3 eggs, 300g self raising flour and 2 tablespoons of ground almonds and mix until all combined, then give it a good beat until it changes colour and is a nice smooth mixture. 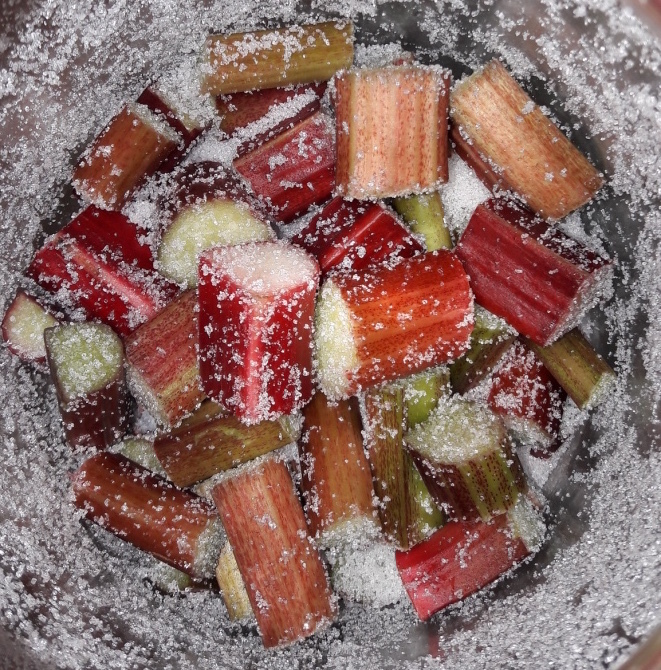 Then stir in up to 400g of chopped rhubarb (1-2 cups). Spread into a greased and lined cake tin – 20cm round or 1lb loaf. 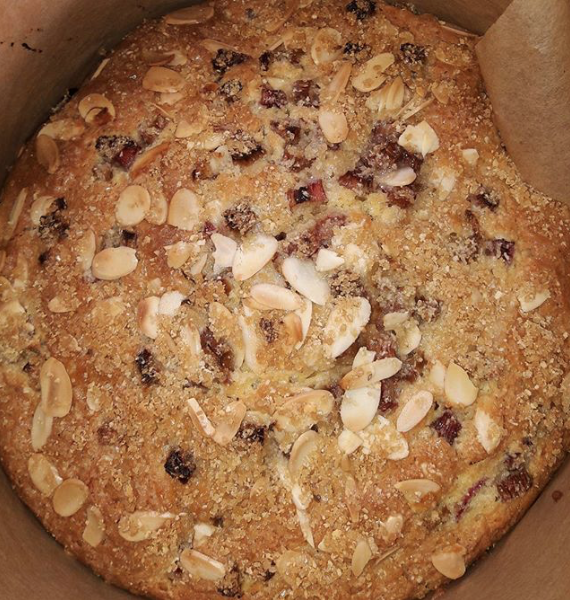 Sprinkle on demerara sugar and flaked almonds – I do this by eye. Bake at 180 degrees/gas mark 4 for 40 minutes, then check how it’s doing, depending on the tin and your oven it may need another 10 minutes. Leave it to cool before getting it out of the tin – handle with care, it may be a little fragile, especially if you’ve used more rhubarb. 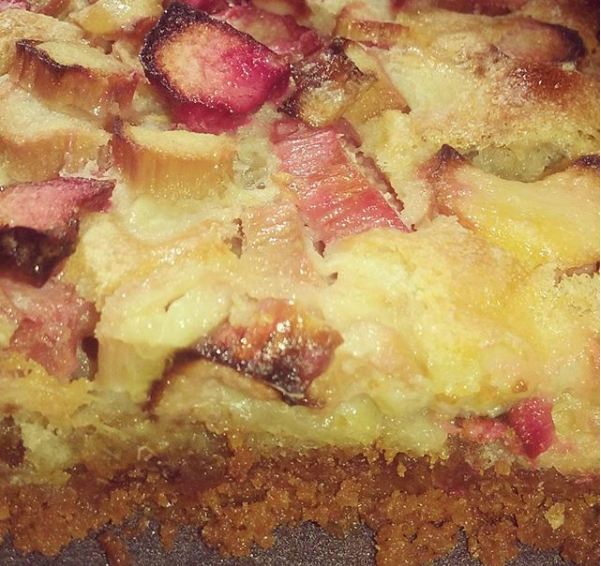 I hope you enjoy these recipes and much as we do, if you have any rhubarb favourites, please feel free to share them in the comments section below.